Kasur Ngodup Dongchung was born on 31 December 1956 at Surtso, a small village in Nyanang County, Tibet. After escaping into exile with his parents, he received his primary school education at the Namche day school of Delekling settlement, Solokhumbu, Nepal. He joined the Central School for Tibetans, Dalhousie, in April 1964. After finishing school in 1973 he joined Ramjas College, Delhi University, and earned his BA (Hons.) degree in Political Science in 1977. Mr. Ngodup joined the Central Tibetan Administration as an assistant Office Secretary at the Department of Security on 15 June 1977 and became a full fledged official on 1 September 1978. He was promoted to Deputy Secretary in March 1987. He was later promoted as Additional Secretary in July 1991 and took charge as the department’s Acting Secretary in November that year. He was promoted as the department’s Secretary in April 1993 and continued to serve in that capacity till 2007. On 4 October 2007, Mr. Ngodup Dongchung was nominated, and duly approved by the 14th TPiE, as a Kalon. 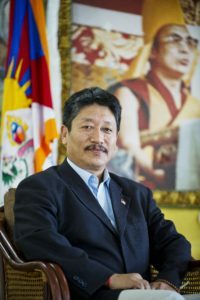 Again in 2011, under the political leadership of Dr. Lobsang Sangay, he was nominated and approved as the kalon for Department of Security, Central Tibetan Administration. However, he retired as the Kalon of Department of Security on 6 April 2016. On 1 June 2016, He was appointed as the Representative of His Holiness the Dalai Lama in Delhi succeeding Kasur Tempa Tsering. On 10 August 2016, he takes charge as the Representative of the Bureau of His Holiness the Dalai Lama.